New York City has had a two-hundred-year romance with water. It needs it, uses it, loves it. It wouldn’t exist as it is, without water. But in the wake of Hurricane Sandy, one has to ask if this longstanding romance has ended with a kiss of death. When the Dutch first came to the New World, they found in the southern tip of Manhattan the perfect site for a trading post: a vast harbor, and access to the sheltered waters of Long Island Sound and the river we now call Hudson, which stretched deep into the interior of the continent. They wanted to trade with the native peoples, and this was the ideal spot for a settlement. The result, in 1626, was New Amsterdam, which, unlike many of the Thirteen Colonies, was not founded with a vision of an ideal community, but strictly for down-to-earth, grubby commercial purposes; here, what counted was trade and money. (This of course has long since changed.) Peter Minuit is supposed to have bought the island of Manhattan from the local Indians for $24.00 in trinkets and beads, which has always been seen as a slick bit of fleecing, and an early indication of how white sharpers would diddle the native peoples out of their land. But this figure is a nineteenth-century miscalculation, endlessly repeated; what he really paid was 60 guilders’ worth of goods, a price in line with other such purchases of the time. No real estate bubble back in those days; land was cheap. And who were the inhabitants of the settlement? The Dutch of course, but also, in time, refugees from Puritan England and the morally stricter New England colonies, plus Huguenots from France, Sephardic Jews, Germans, Italians, Africans (both slave and free), Bohemians, Walloons, Irish, Swedes, Danes, and a sprinkling of Mohawks and other native peoples -- in other words, a real mishmash. And among the mishmash, right from the start, were pirates, prostitutes, smugglers, and every kind of commercial hustler. (This too of course has long since changed.) Clearly, no tight immigration laws here. Eager to build up the population, the authorities let just about anyone in. So right from the start, the inhabitants of Manhattan were a free-wheeling community, trade-oriented, money-loving, enterprising, and above all diverse. New York, 1671, seven years after the British conquest. What the Dutch were after was furs, and they established Fort Orange far to the north on the site of present-day Albany, where they had greater access to the tribes they traded with. Otter, mink, and even wildcat skins were traded, but above all beaver, the raw material for a durable, high-quality felt especially suited to hat making. A well-brushed beaver hat said elegance, wealth, status; everybody who was anybody wanted one. When the British seized New Netherlands in 1664 and New Amsterdam became New York, the beaver trade continued unabated. The cocked hats of the eighteenth century – those funny three-cornered hats that George Washington and all the Founding Fathers wore – were beaver, as were the top hats that replaced them in the nineteenth century, until, in the 1850s, beaver hats were supplanted by silk. by beaver hats. Which shows why all those beavers had to die. The fur trade could not have existed without the Hudson, which linked New Amsterdam to Fort Orange, and then New York to Albany, in a time when travel by land was tedious, jolting, and often dangerous. But navigating upstream on the Hudson was problematic, since the current flowed downstream, tides reversed regularly, and sudden gusts of wind could drive small craft off their course. The canny Dutch had tried a number of small craft, and after them the English went on to perfect the Hudson River sloop, a single-masted, shallow-draft, fore-and-aft-rigged craft ranging from 60 to 140 feet in length that was especially adapted to Hudson River commerce. Sloops carried both passengers and freight, but the trip upstream to Albany could take as long as three days. Upriver went manufactured goods and imports; downriver came furs, grains, farm produce, and even cattle. Only with the advent of steam did the sloops begin to fade from the scene, though they continued to handle local commerce well into the nineteenth century. So since steam came in long ago, sloops are a thing of the past, are they not? Wrong! The sloop Clearwater sails the Hudson today, advocating greater respect for the environment and a cleaner river. An inspiration of folk singer Pete Seeger and others, it was closely modeled on the sloops of the past, though to find a shipyard capable of building it meant going all the way to Maine. (Ah, those clever Yankees!) I have connected with it several times, sailed on it once for an hour or two, and support it with modest contributions. Few New Yorkers are aware of Sandy Hook, the thin seven-mile spit of sandy land that juts out from the Jersey shore to form the southern limit of New York’s Outer Harbor (or Lower New York Bay). In fact, few New Yorkers today are aware of the existence of an Outer Harbor, though in the nineteenth century it was busy with pilot boats providing pilots to guide sailing vessels through the Outer Harbor’s treacherous maze of sandbars, and news boats eager, in those days before the telegraph, to get foreign newspapers and the latest word of happenings abroad. Only when incoming vessels were cleared by Quarantine, an installation on Staten Island, and passed through the Narrows to the busy Inner Harbor, could they tie up at one of the many piers jutting from the shore of Lower Manhattan. And what did those incoming vessels bring to this busiest of ports? From Britain came iron pots and pans, steel knives and scissors, dog collars, compasses, thimbles, fencing foils, curtain rods, hammers and nails – just about any manufactured metal object you could name – and even more important, dry goods such as woolens, muslins, calicoes, broadcloth, and what was labeled sheetings and shirtings. And why such quantities of textiles? Because the fashionable lady of mid-century required some thirty yards of material for her dress, while the unmentionables underneath it brought the total close to a hundred yards. Never before or since have women been so abundantly garbed. Clearly, this was no place for Coco Chanel’s petite robe noire of the 1920s, with its emphasis on elegant simplicity, a style still in vogue today. But the ladies required more than this. From France came “fancy goods” such as silks, laces, ribbons, embroidered stockings, gold-embroidered bead bags, and the latest hats and bonnets whose price, even in New World imitations, could bust hubby’s budget for a month. So you see the pattern: from Britain, basics; from France, frills. 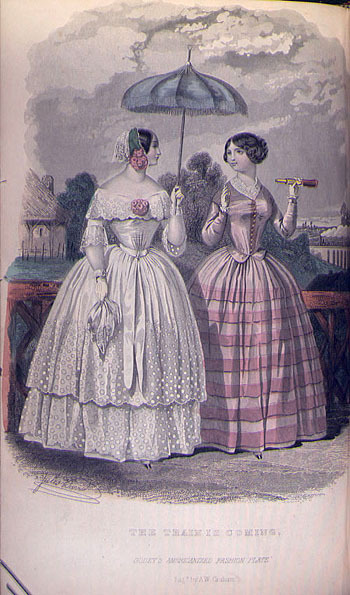 But the ladies needed – demanded – those frills. And their needs kept the mills of Birmingham and Lyons busy. And what was New York sending back to Europe in exchange? Furs, grain, naval stores, cattle, and above all cotton. Cotton? From New York? Why not from the ports of the South? Ah, because the Southern planters always needed a loan with their next crop as security, and hustling New York commission merchants were happy to supply those loans, but in the process lured all that cotton north to New York, where it would be transshipped for export to Europe, while all kinds of fees were being collected. So were the canny Yankees outwitting those poor planters? Not really. The Yankees lined their pockets, but the planters, freed from the grubby details of business, could sip their mint juleps at leisure, or do whatever, while the slaves looked after the cotton. Given such shrewd dealings, is it any wonder that New York by mid-century was a roaring metropolis, its harbor crowded, its docks jammed, the biggest port in the hemisphere, doing business with every corner of the globe? To it, in addition to imports from Europe, came cigars from Cuba, hides from Rio, tea from Canton, Kentucky tobacco and Mexican silver from New Orleans, and buffalo robes from God knows where. And all of it on American ships. A bird's-eye view of Manhattan, 1879. Both steam and sailing vessels abound. But the Brooklyn Bridge was in fact still under construction. 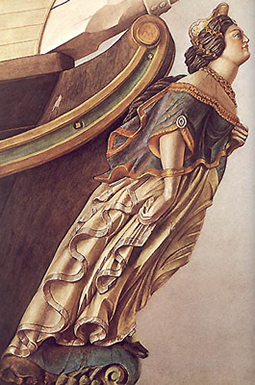 Under the bowsprit of sailing ships there was always a figurehead that sailors believed would bring good luck. This tradition can be traced back to ancient Egypt, but by the nineteenth century such figures, always in a forward leaning position, might include patriotic figures, national heroes, and above all female figures, properly clothed or not, usually full-busted, sometimes representing the wife or daughter of the shipbuilder (definitely clothed), or perhaps a mythological figure like Venus or a Naiad (clothing optional). But in England Queen Victoria and Lord Nelson also appeared, appropriately garbed, and in this country, after her triumphant 1850 concert, even Jenny Lind. Spectacular among the ships in New York harbor in the 1850s were the clipper ships, with a sleek slender hull, sharp bow, raked masts, and vast expanse of sail, small, swift vessels especially suitable for carrying low-volume, highly profitable goods – tea, opium, spices, people, mail – over long distances. The departure of a clipper for California or Canton was a major event, watched by crowds at the Battery, eager to see the glistening sails catch the wind, while the crew sang sea chanteys -- the words often raucous -- as they went about their tasks. Averaging 250 miles a day – far more than the ordinary sailing vessel – and under favorable conditions even 400, the clippers in record time brought perishable tea from distant Canton to the thirsty palates of Gotham, and delivered eager prospectors to California so they could indulge their lust for gold with the least delay. (Few of them came back rich.) Both the China trade and the California trade meant rounding Cape Horn, which in summer involved making way against snow, sleet, high waves, and fierce, shrieking winds. But when one clipper caught a wind dead astern all the way across the less formidable Atlantic, it reached Europe in an amazing five days, the standard time for the transatlantic steamships of the twentieth century. Another type of swift vessel in demand in the 1850s was the schooner, whose speed might let it outrun any British warship prowling off the coast of Africa. And why would this be necessary? Because New York in the late 1850s was the center of the illegal pre-Civil War slave trade, taking slaves from Africa to Cuba, a trade that the British Navy was trying to stop. Few New Yorkers today are even aware of this dark chapter in their city's history, but the records of the time leave little doubt. How the Lincoln administration finally ended this long tolerated trade will be told in a future post. New Yorkers have always loved parties, including civic ones. Two great celebrations marked the city’s romance with water in the nineteenth century. On October 25, 1825, the whole state celebrated the opening of the Erie Canal, which linked Lake Erie to the Hudson, the Great Lakes to New York and the Atlantic. Immediately a cannonade by canons placed at intervals all along the canal and the Hudson resounded, booming all the way to New York City to announce the event. (Noise pollution was not an issue in those days.) Governor DeWitt Clinton, long a champion of the canal in the face of much opposition, led a flotilla of canal boats that traveled the length of the canal from Buffalo to Albany, and then, hauled by tugs, down the Hudson to New York. 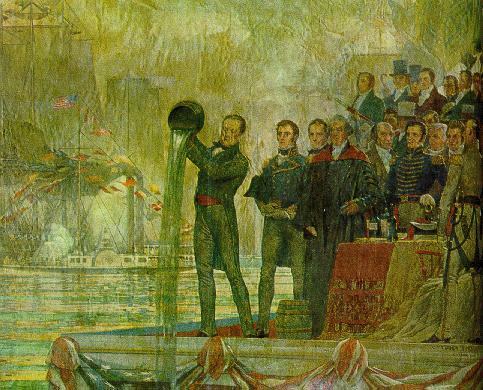 In New York, when he arrived ten days later, the governor ceremonially poured water from Lake Erie into the city’s harbor, symbolizing the Wedding of the Waters. Nor was the celebration premature or ill advised; this linking of the Middle West to the Atlantic coast greatly reduced the cost of transporting goods, and helped New York become the biggest and most prosperous port in the hemisphere. If you think that was quite a party, wait till you here about this one. Because commerce and prosperity are all very fine, but there's nothing like a flush toilet and a hot bath in your home. On October 14, 1842, the city celebrated the opening of a municipal water supply system that brought water from the Croton River, many miles to the north, into a reservoir on the site of the present public library on 42nd Street. The event was celebrated with a hundred-canon sunrise salute, tolling church bells, speeches, the singing of an ode, and a five-mile-long parade of dignitaries, soldiers, volunteer firemen, butchers, trade unions, college faculties, ladies’ auxiliaries, and blaring bands, all of them passing the fountain in City Hall Park that was spurting skyward a fifty-foot plume of water. Concluding the ceremonies was a cold buffet for invited guests at City Hall, where – astonishing for bibulous Gotham – the only lubricants were Croton Water and lemonade. Now at last New Yorkers – those willing to pay a water tax – could have running water in their homes and enjoy there the voluptuous pleasure of a bath. But the urge toward temperance proved momentary; by the next day New York had returned to its sodden ways. On this happy note I'll end this first account of New York's love affair with water. Future posts will tell about the coming of steam and the marvels and follies that resulted; New York City's history is rarely dull. But before that there'll be a post offering a hodgepodge of New York anecdotes and lore, ending with a forbidden island with over 800,000 graves -- an island that most of us will never set foot on, unless we are taken there in handcuffs.